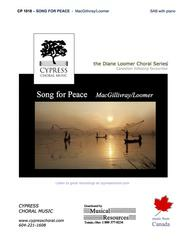 Song for Peace (SAB) composed by Allister MacGillivray (1948-). Arranged by Diane Loomer. For SAB choir and piano. Octavo. Published by Cypress Choral Music (C3.CP1018).One of Allister's most popular folk tunes originally written for solo voice -- arranged for solo and choir. The tune has the typical MacGillivray lilt and the harmony is correspondingly uncomplicated.